I remember seeing a perfect example of that years ago on Seinfeld. For the benefit of my non-North American readers, Seinfeld was a popular American television series throughout the 1990s, that sort of cynical, sarcastic humour that Americans seem to love so much. On the show there was a particular character named George. 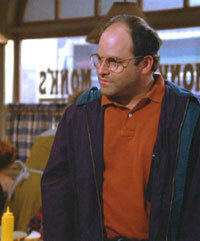 George was a neurotic, humorously annoying character. Being a bit of a scheming, manoeuvring sort of fellow, everything George did invariably turned out bad for him. Thus he went on doing and saying the exact opposite from his normal, negative urges. And all of a sudden, beautiful women started giving him their phone numbers. Great new job offers started pouring in. Everybody he met wanted to be his friend. All of a sudden, as if the earth had suddenly reversed its direction, everything started coming up roses for unlucky George. Of course this was just a piece of pop-cultural comedy, but the message behind the entertainment was surprisingly enlightened. It reflected a universal truth that even self-absorbed George (or the programme’s writers) somehow tapped in to – the truth that we are not just being affected by events around us, but we actually significantly AFFECT those events and their outcomes. Like George, most of the time we are our own worst enemy, and any pain, aggravation or stress we’re experiencing is simply coming from our own actions and reactions toward everything. Just like George, by changing our actions and reactions to everything, we can, and WILL change the results. In yoga, we have a term for this. It’s called Pratipaksha Bhavana, which refers to a conscious effort to immediately, by an act of will, replace any negative or lower thought as soon as it arises, with an opposite, more virtuous and positive one. Maybe that simple attitude adjustment sounds like a bit of flakey “wishful thinking” sort of stuff, but what we’re doing here is actually very scientific. Perhaps you might think that everything you say and do results from a process of lucid, rational thought? Sorry, but it just ain’t true. Pretty much all of our daily actions and words are actually just unconscious reactions, things that just “come out of us” as a result of a lifetime of conditioning, with very little conscious thought ever entering the picture. 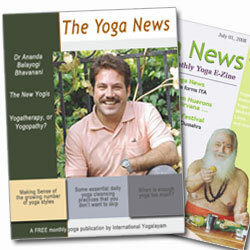 What we’re doing with the practice of Pratipaksha Bhavana is creating a Stimulus-Response Gap … a short pause between the “taking in” of an external situation, and our reacting to it … a brief moment to stop and consciously formulate our actions and words instead of letting the autopilot “auto response mechanism” decide what comes out of us. Creating conscious actions, instead of unconscious reactions! The more we do this the more we re-condition our behaviour and reformulate that set of reactions that used to get us into so much hot water in the past. By consciously thinking before we speak or act, over time we are able to shorten that stimulus-response gap to the point where we’ve re-trained our subconscious to spontaneously act and re-act in a more positive, evolutionary way to everything. And guess what? We naturally produce less stressful results for ourselves. But even if you don’t care about the science behind it all, it still works. The Power is, as they say, IN THE PRACTICE. So the next time you feel the urge to knock down an old lady for that last free seat on the bus, just take a moment and see if a little attitude adjustment might help you to find a more enlightened approach to the situation. You’ll be doing yourself a big favour in the long run, and my grandma will thank you for it too.